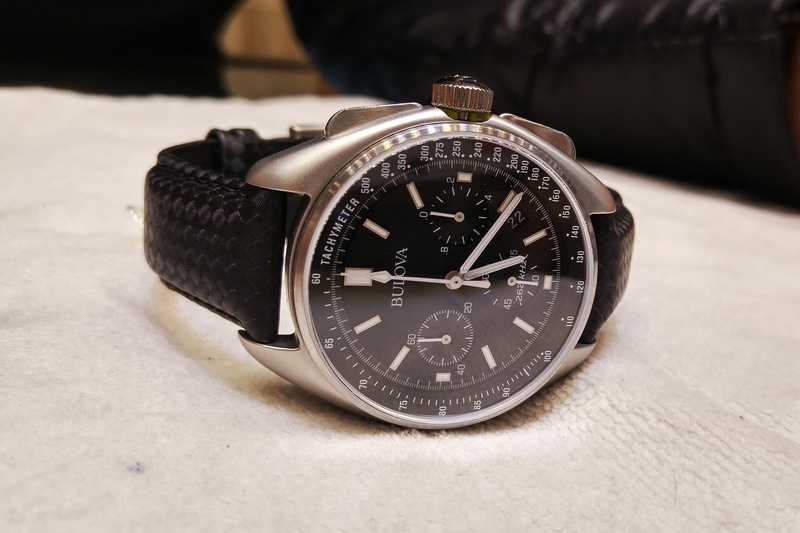 You may recall a post late last year about an impending re-edition by Bulova of the watch Apollo 15 commander David Scott’s Bulova that he wore on the third of his 1971 moonwalks. 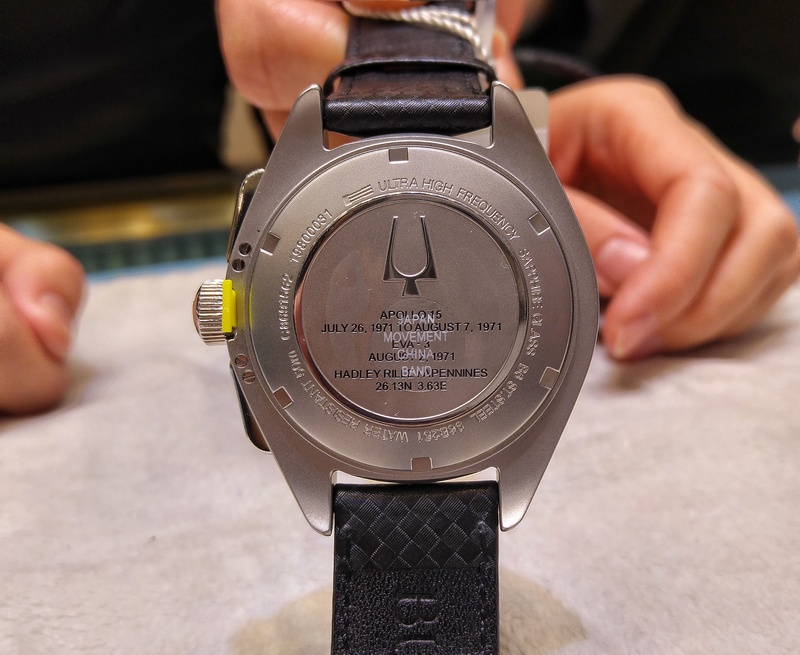 The re-edition was purportedly going to be available from January 2016, but ended up having its launch at Baselworld 2016, and it is now available in Australia. I visited a Sydney authorised dealer to take a look, and here are some quick phone photos of it. Updated using Bulova’s UHF (Ultra High Frequency) quartz technology, it has luminous hands and markers, tachymeter and calendar in a stainless steel case with a 50m water resistance. It comes on a black leather strap and with a second velcro strap modelled after the one Scott used to wear his Omega and Bulova watches. Scott had the Bulova Chronograph prototype with him as a personal backup, unbeknownst to NASA. Bulova had asked him to test the watch, to see how it would perform during the Apollo 15 mission. As he prepared to go outside for his third (and last moonwalk) on August 2, 1971 he found that his Omega Speedmaster’s crystal was missing, having popped off at some point. As it was not authorised to use for this mission, and in light of NASA’s relationship with Omega, its use was pretty much left quietly to the annals of space history, with the watch itself kept by Scott until he decided to sell it. Its worth remembering that Bulova had been one of the watch brands in the running during the original NASA trials to be the official NASA ‘space watch’. On the new watch you can see the “262 KHz” on the dial. 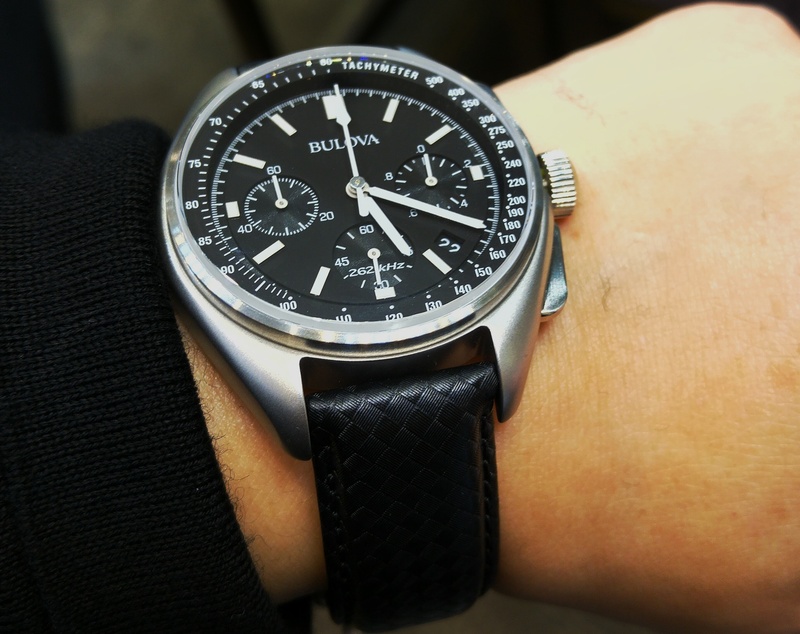 Bulova (owned by Citizen) has been releasing a number of UHF-powered watches, with the frequency stated on the dial. Apart from the brand typeface and KHz text on the dial it looks like the original, with the same case shape and elongated rectangular chronograph pushers. To handle, the watch is fairly slim and not heavy. I did not get to actuate the pushers because they had the protective yellow ‘stoppers’ on them (which they did not offer to remove). I had popped into the authorised dealer along with someone else, and whilst I found myself quite liking it (I would wear it) he did not like the overall ‘feel’ of it, finding it a bit lightweight. However, we both liked the simple matter of fact engraving on the case back, which is a nice touch. 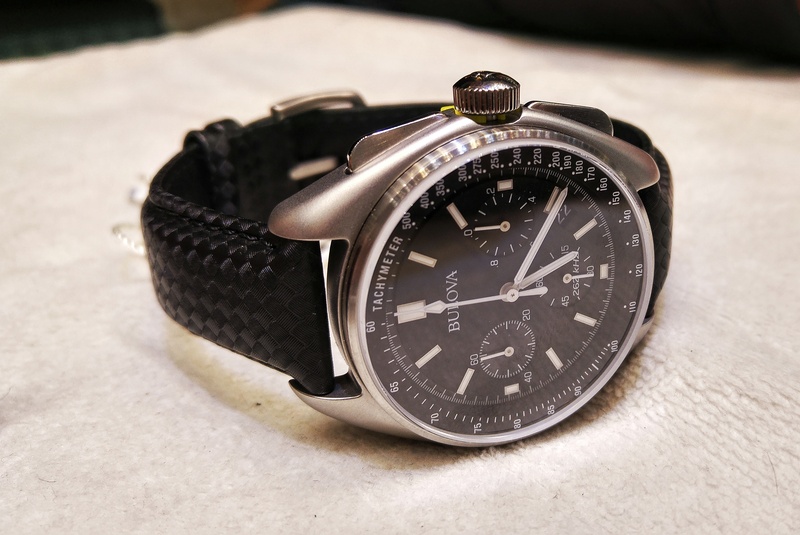 At an Australian RRP of $899 (I was offered a better price on this by the dealer, who does not know me) it is a more accessibly priced alternative to Omega for those with a keen interest in moon watches, and moon watch completists.